A survey of almost 300 farmers conducted in July aimed to show which black-grass control tactics in Stephen Moss’ ‘5 for 5’ initiative (croprotect.com/weeds/to-beatblack- grass) are being used in practice and gauge their effectiveness. Although the initiative is only in its first year, there appears to be good uptake of many of its principles, with 41% of farmers using them when constructing control programmes, as the results in the graphs illustrate. Actively avoiding seed entering fields (for example, by cleaning machinery or refusing straw from unknown sources) is the most popular option for preventing seed return, used by two-thirds of growers in the past three years, 30% of which rate it as their most important part of overall black-grass control. Roguing and patch-spraying are also clear favourites, while more than one-third spray-off areas of more than one hectare to prevent seed return before harvest. Bayer’s Dr Gordon Anderson-Taylor says: “If black-grass control measures are to have any long-term impact, they must reduce numbers in the seedbank. Many (54%) growers are also considering novel methods of seed capture or destruction, although relatively few do so at present. Several new ‘harvest weed control’ approaches have been developed in Australia for tackling rye-grass, such as systems which crush seed at harvest or place chaff into dense rows in which seeds are predated or rot. “As black-grass sheds a large proportion of seed before harvest, these methods are likely to be less successful than for rye-grass which retains seed. Post-harvest stubble cultivations and opportunistic or rotational ploughing are favoured cultivation options for black-grass control, used by almost two-thirds of growers. However, there is also strong support for lower disturbance techniques, such as minimum tillage and direct drilling for winter and spring crops, perhaps reflecting the UK’s diversity of cultivation strategies and soil types. Cultivations which allow rapid crop establishment will help weed control by increasing crop competitiveness, he notes. By far the least-used option is the inter-row hoe/harrow, which only a small minority of farmers regard as important to black-grass control. The resurgence of spring cropping in areas of high black-grass populations is neatly illustrated, with almost three-quarters of growers having changed crop rotation in the past three years, favouring spring cropping. Some 18% increased the spring-sown crop area by more than half. Generally, many farmers (40%) were ‘very satisfied’ with the performance of spring crops in terms of black-grass control and financially, although some are less impressed. Indeed, 30% of growers say although black-grass control is satisfactory, financial performance is not, while 19% are unhappy with either aspect. Improving competitiveness of crops against black-grass is something many growers are doing already and planning more of in future. The main route is through sowing higher seed rates and growing more competitive crops (for example, winter barley) or varieties. Improving drainage is seen as another important way to improve crop competition, with more than two-thirds of growers having conducted drainage improvements, and a large proportion (20%) considering future works to improve black-grass control. Narrow rows are a further option many are considering as a way of improving crop competitiveness. 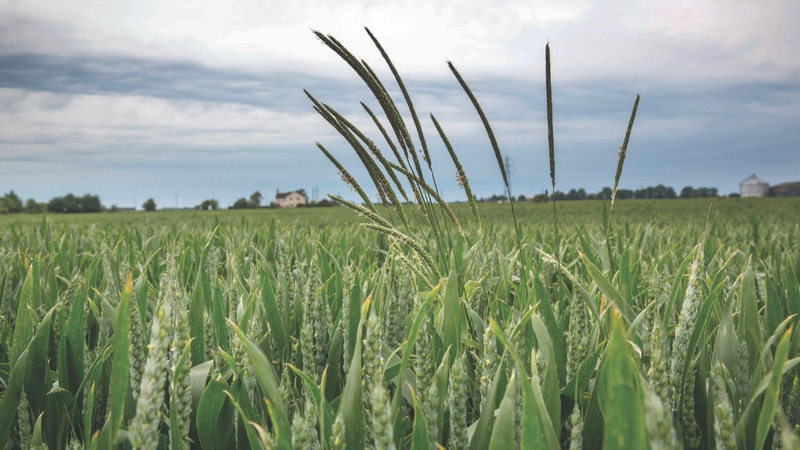 The survey suggests cover crops are the least popular option, although those who have used them believe they play a reasonably important role in overall black-grass control. Dr Anderson-Taylor says the aim of cover crops is not to outcompete black-grass, but to retain soil structure without reducing black-grass emergence over winter, enabling spring drilling of a crop with minimal soil disturbance after an early glyphosate treatment. Much is made of the cultural aspects of black-grass control, but there remains strong support for the timely application of effective herbicides as part of a fully integrated strategy. Applying glyphosate to kill weed flushes emerging before drilling is the most popular option, with more than half of growers rating it as their most important herbicide technique. Growers recognise the value of correct timing and application technique, and the use of multiple pre-emergence herbicides (as tank mixes, stacks or sequences) instead of single pre-em products. Almost three-quarters (71%) have applied multiple pre-ems in the past three years. Dr Anderson Taylor says: “Attention to detail regarding seedbed quality, timing and application technique will greatly benefit pre-em weed control. He urges caution when using complex herbicide stacks, especially as the risk of crop damage can increase, potentially reducing early competitiveness. Effectiveness also depends greatly on soil conditions and weather around application. For most growers (48%), annual herbicide spend is about £80-£120/ ha, with one-third in the ‘up to £80/ha’ category, and the remainder spending more than £120/ha. Unsurprisingly, herbicide-resistant weeds are the top concern for growers, followed closely by the lack of new products and regulatory changes which may restrict or prevent the use of existing products. For any black-grass control strategy to be effective, it must be implemented well and reviewed regularly to ensure it is working. The winner of the iPad for completing the Blackgrass survey was William Spence from Wiltshire. A further 50 respondents have been advised they have won a free black-grass resistance test. Recording the amount and location of black-grass is a key part of this and something most growers surveyed do to some extent; 39% do so for every field, every year, while others do so in some fields or some years. Most review their control strategies, either every year (61%) or every three to five years (19%). A minority did not review progress or did so on a less frequent basis. Dr Anderson-Taylor is encouraged by the good awareness and widespread adoption of the many cultural techniques in the armoury for black-grass control highlighted in the survey, but reiterates the importance of adopting a range of controls.